The power of pumpkin is not just for fall. Autumn may put you in the mood for some pumpkin pie, but pumpkin nutrients and benefits are great all year round. The nutrients in pumpkin are really world class because they are rich in fiber and an abundance of disease-protective nutrients including potassium, magnesium and vitamins C and E. And pumpkin contains one of the richest supplies of antioxidant carotenes compared to any food. Pumpkin is one of the 14 "Superfoods" highlighted in Dr. Steven Pratt's groundbreaking nutrition book SuperFoods Rx: Fourteen Foods That Will Change Your Life. And, The Food and Nutrition Board of the Institute of Medicine states that "higher blood concentrations of beta-carotene and other carotenoids obtained from foods are associated with lower risk of several chronic diseases." Both carrots and pumpkin have the best balance of alpha and beta-carotenes. Furthermore pumpkin is helpful in soothing upset stomachs. 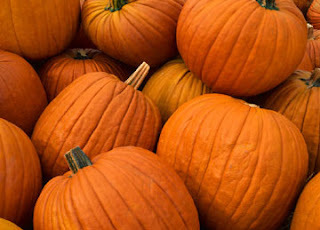 Looking for the benefits of pumpkin for your dog? Thrive Foods offers Hip Health Pumpkin Spice human grade SuperTreats for dogs. Our Pumpkin Spice treats contain the power of pumpkin. They have natural antioxidant protection from pumpkin, cranberries, cinnamon and flax seed, so your dog is happy and healthy from the inside out. They also have turmeric, ginger, and cinnamon SuperSpices with antioxidant benefits. Turmeric is know for the powerful antiflammatory properties of a compound called curcumins. Science has long held that damage by oxygen free radicals is behind many of the illnesses that come with aging, including cardiovascular disease and cancer. There's firm evidence that a high intake of fruits and vegetables reduces risk of cancer and that a low intake raises risk. And recent evidence suggests that diminished brain function associated with aging and disorders such as Alzheimer's and Parkinson's diseases may be due to increased vulnerability to free radicals. Such evidence has spurred skyrocketing sales of antioxidant vitamin supplements in recent years. But several large trials testing individual antioxidant vitamins have had mixed results. "It may be that combinations of nutrients found in foods have greater protective effects than each nutrient taken alone," says Cao from the USDA. For example, foods contain more than 4,000 flavonoids. These constitute a major class of dietary antioxidants and appear to be responsible for a large part of the protective power of fruits and vegetables. Combinations of nutrients found in foods may have greater protective benefits than each nutrient on its own. Many people obtain a number of their daily nutrients from supplements in pill or powder form, but in order to receive the best form of nutrients, it is essential to receive them from plant chemicals rather than just from supplements. There are certain types of plants that have a better antioxidant level than others, and the ORAC score can measure these. Different types of fruit and vegetables have different ORAC scores. The recommended “5-a-day” fruit and vegetable servings will give you an ORAC score of 1,750 units. You could pick seven fruits with a low ORAC level and achieve only 1,300 ORAC units, or you could pick seven with high values and receive around 6,000 ORAC units or more. A large handful of blueberries would give you an ORAC score of around 6,000. Studies have shown that eating foods with a high ORAC score will raise the antioxidant levels in the blood by around 10 to 25%. The ORAC figure suggested by experts is around 5,000 units per day to have a significant effect on plasma and tissue antioxidant levels. Eating eight to ten servings of brightly colored fruits and vegetables or dark greens will help achieve this level, but only a handful of cranberries could satisfy this requirement. Oats have a decent amount of antioxidants, but we only really consider them for fiber. Not all oils are created equal: olive oil has 10X AOX compared to peanut oil. Spices can really boost the antioxidants in your meals - use them profusely. Berries are one of the richest sources of fruits - blueberries, cranberries, blackberries, strawberries. Nuts contain a decent amount of antioxidants. Pecans and almonds are great. Cocoa - so glad to see it on the list of rich AOX foods. Not milk chocolate, but the pure stuff.